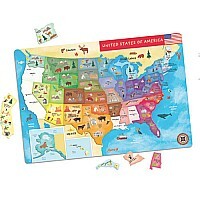 A 36 piece puzzle of strong cardboard with a picture makes you want to enter the story and then tell what happens next! Presented in a solid locking cardboard "hat" box for storage after play. Pieces are returned to a suitcase, easy to stack on a game shelf and easy to grab and transport.